Public transport service is likely to be affected in Bengaluru on September 2nd, in the wake of the strike called by the public transportation sector. KSRTC buses and autorickshaws will remain off road from 6 am to 6 pm on September 2nd. The nation-wide strike is called by Central trade unions urging the government to fulfill their various demands. The four public transportation companies in Karnataka- Bangalore Metropolitan Transport Corporation (BMTC), Karnataka State Road Transport Corporation (KSRTC), North Eastern Karnataka Road Transport Corporation (NEKRTC) and North Western Karnataka Road Transport Corporation (NWKRTC), have extended support to the bandh to place their demands before the government. 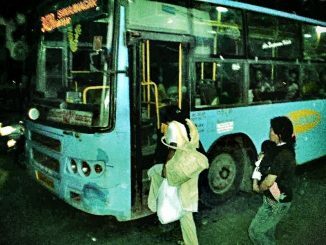 Speaking to Citizen Matters, BMTC General Secretary A N Murthy informed that as many as 6,000 BMTC buses will remain off road from 6 am to 10 pm in support of the strike call. KSRTC Staff and Workers’ Federation Office Secretary Manjunath said that KSRTC buses will be operational from 6 pm on Wednesday. “Though strike has been called for 24 hours, we will start plying the buses from evening so that passengers who have reserved the tickets for Wednesday night will not be affected,” he said. The protest is against the proposed Road Transport and Safety Bill, 2014. They believe that the Bill will lead to privatisation of transport system in the State. “We are also demanding that the government reduce penalty amount imposed on drivers for causing accidents proposed in the new Bill. Other demands include, abolishing contract system in recruitment, minimum wages for employees etc.” While the protesters are demanding a minimum wage of Rs 15,000 per month, other demands are control of price rise, no violation of labour laws, no outsourcing and pension for all. Out of seven autorickshaw associations in the city, five associations have supported the bandh, due to which auto service too is likely to be affected. However, taxis and trains will operate as usual. The 10 central trade unions which have called for nation-wide strike have claimed it as a strike against anti-labourer economic policies of the government. Public sector banks, insurance companies and post offices too will remain closed on Wednesday. The essential services liek milk, medicines, hospitals etc may not be hit today. Some private schools and colleges have declared a holiday. Cab services like Ola and Uber may not be hit. Car pooling might be a good option if you have a group of people going to same place. If you encounter any problem, call 100 or 103. It doesn’t talk about safety on buses. It encourages privatisation of public transport, going against a global trend. The Bill is shoddily prepared and is not complete. The Bill centralises powers in the hands of a national authority. It privatises the very governance of transport, with two national and state authorities, where only private individuals are members of the authority. The Vedike, after analysing the bill, feels that the bill puts the onus of maintaining road safety on pedestrians, commuters and cyclists, who consist of maximum users of public roads and transport system. The bill doesn’t talk much about road infrastructure design or governance of transport corporations, how to ensure safer roads, plan efficient transport systems, or collect taxes, says a press note from Bengaluru Bus Prayanikara Vedike. The Bill calls for creation of two national and two state authorities to govern transport. Both these authorities will have private people as members, and the central and state ministers of transport do not even have a vote in these authorities. There is no reporting mechanism clearly mentioned in the bill. There are no adequate safeguards to ensure that conflict of interest does not arise between the members. No one can prevent private players from being in this committees and taking decision to favour their businesses. The transport system and governance of roads must lie with the state government or with other local bodies for efficient decision-making. The state-run Bangalore Metropolitan Transport Corporation is accountable to the bus commuters. The subsidies and incentives that the BMTC offers to its commuters will be hacked if private corporations take over. There is no rationale given by the government on why the privatisation is being done. Vedike supsects that privatisation of bus transport systems will lead to private players fulfilling their profit-making agenda and neglect the interests of the public. The Vedike says that world over, countries are ensuring that public transport is in public hands to ensure access to accessible, affordable transport with the widest reach, and supports the Bandh call given by various organisations. This article covers only a part of why the bandh is being held all over India. It is against NDA government’s proposed Bills amending labour laws, the Contract Act, the Electricity Act and Factory Act to employees positions weak and industrialists stronger against all established norms. Also farmers in Karnataka are having their own version today against farmer deaths.